they are nice and fluffy...and yummy! 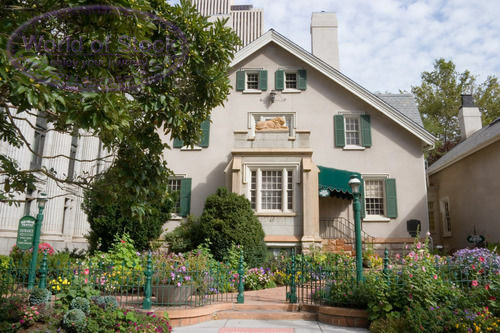 Lion House Pantry is located in downtown Salt Lake City and is famous for their pastries and bread. According to an article, click here, every year for Thanksgiving, they make 11,000 pies, 75,000 cookies and 65,000 dozens of dinner rolls. Yes, DOZENS! Amazing!! that's a lot of rolls! These legendary rolls are sold for $6.00 per dozen at their bakery/outlets, but of course it costs less than $3.00 for 20-24 pieces if made at home and they made it possible for us to make them ourselves by sharing their recipe and procedure online. Just a side note: These rolls remind me of our own Filipino bread called "Spanish Bread". The concept of brushing the rolled out dough with butter then cutting it into smaller pieces, and rolling up each piece is the same, however, the main difference is that we sprinkle white sugar on top of the butter before rolling them up and then brushing the top of the baked bread with more butter or margarine and finish it with sprinkling white sugar and/or bread crumbs on top. the taste is Heavenly! and they are pillow soft. as they appear on a cover of one of their books. Their recipe and procedure is on the net, so I will direct you to their site. As always, I used my bread machine to make the dough for these rolls where I let the machine do the mixing and kneading, then I do the fun part. The original recipe doesn't ask for vital wheat gluten and dough enhancer, but for some reason I can't part from my secret ingredients and so I did use them. I also used 1 Tb + 1 tsp of Saf instant yeast and used more flour than suggested on their recipe. As you know when making bread, we get different results from baking them from one area to another even from a kitchen to another kitchen. So, if you think you need to make some adjustments on the liquid or flour, don't be disappointed because that happens. While I was making some of the Lion House Rolls the other day, I decided to make Spanish Bread with half of the dough to see if our G'kids would like them. To my surprise, they did! in fact our 15-year old G'daughter said she ate 5 pieces and would have eaten more if she wasn't concerned about gaining weight. Spanish Bread are rolled like Croissant rolls. When baked, they are brushed with melted margarine and sprinkled with white sugar. Querida hermnita:podria facilitarme la receta en español por favor de 336_Lion House Dinner Rolls ?muchas gracias.un besito. Maria Elena, please Click on the Google Translate on right side top corner of this page...gracias!! María Elena, por favor haga clic en el Translationes de Google en la esquina derecha superior de esta página ... gracias!